Luxury 30A Dune Allen Beach Rental with Unobstructed Gulf Views from All 3 Levels! This rental in Dune Allen Beach is an exquisite, 5 Bedroom/6.5 Bathroom house on 30A with unobstructed gulf views from all 3 levels! 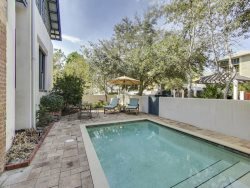 The beach access is directly across the street and the house features a heated pool. An elevator and a gas grill add to the conveniences of renting this property. As you enter, the gorgeous wood flooring is throughout. The first bedroom has two twin beds, flat screen TV and private bath. The bathroom has a glass shower with granite counters. You will also find a game room on the first floor with doors leading out to the pool. This room has a leather, queen size sofa sleeper, large flat screen TV, table to play games, and private bath with shower/tub combination and granite counters. Across the hall is a bedroom with 2 double beds, a large closet, flat screen TV, and doors leading out to the pool. The private bath features a glass door shower, beautiful tile work, and granite counters. On the second level the open living space is a large, open floor plan with plenty of natural light from the many windows overlooking the gorgeous gulf views. Doors open up to a balcony with outdoor seating to relax and enjoy! It is beautifully decorated with comfortable seating and a large flat screen TV. The dining table seats 8 with extra seating at the kitchen bar. The upscale kitchen features unique 'mod dot' stonework, stainless appliances, marble counters, and ample storage. A powder room is located on this floor for added convenience. It features granite counters and a glass bowl sink. The 2nd floor features a queen bedroom, decorated in shabby chic beach style with a dresser, walk in closet, flat screen TV, and private bathroom with glass shower doors. access to the back balcony overlooking the protected dune lake. The 3rd floor has the king master suite with private balcony with gulf views and a flat screen TV. The large master bath has a double vanity with separate tub and glass shower. The second king room also features a private balcony, gulf views, flat screen TV, and private bathroom with glass shower and granite counters. This floor has a full size, high capacity washer/dryer. In this beautiful area of Santa Rosa Beach, there are plenty of places to visit during your vacation. Right on 30A is "The Vue" restaurant. Great restaurant, best view! Be sure to stop into "Stinky's Fish Camp" for the freshest fish on 30a. Just down the road is Gulf Place. This is a beautiful park/lawn area for kids to play or bike. Concerts are often held on Sunday nights and there are several shops and restaurants to choose from. Gulf Place features the 30A store, La Playa and Sunrise restaurants among others. Driving a few miles west is Grand Boulevard. A great place to play, shop, and eat. They also have events in their park and have several restaurants, shops, and a movie theater. Plenty to do and experience! This is the perfect vacation house, book your visit today! 4) If you choose the pool heating option, only the pool will be heated. The spa only has jets and no heater option. Jessica was great to work with. She was responsive and very informative about the area and the house. Our stay at the Dune Allen house on 30A was fabulous. The house is as stunning as the views from the balconies. The home has an unobstructed view of the gulf. We really enjoyed the pool and spa. We paid extra to have it heated but with kids, it was well worth it. All the bedrooms are cozy, beautifully decorated and roomy. Each has a private bath. The 3 story layout was perfect for people to find privacy and to gather all together on the middle floor to view the gulf sunsets, cook, celebrate or just hang out. Jessica was quick to respond to our questions and needs and very pleasant to work with. Beautiful home great for large groups. We lovee the house! It was beautiful and well maintained. The pool was great and location to beach access was very convenient. Ms. Connell was very friendly and always responded to my requests very quickly. VRBO # 642409 was a great house to rent for our daughters wedding weekend. The house was beautifully decorated and has lots of room for a large family get together. The kitchen was very well equipped, I found everything I needed. The bedrooms were very spacious with large closets and everyone had their own private bathroom. We hope to return again soon.